At Mission Mountain School, communication between horses and humans is an important component for developing compassionate and supportive relationships. We typically have 16-18 horses, and a student may be allowed to bring her own horse to the school when appropriate. Our students learn to build relationships with the horses and ascertain how their behavior around horses relates to their own behavior patterns with people. Horses are sensitive and very responsive to non-verbal physical and emotional cues, and will respond to the student’s emotional projection. Horses will not respond to one’s commands unless those commands are congruent with one’s emotional state. This helps our students learn that they cannot change others or situations; that they can only change their own behaviors and responses to situations. 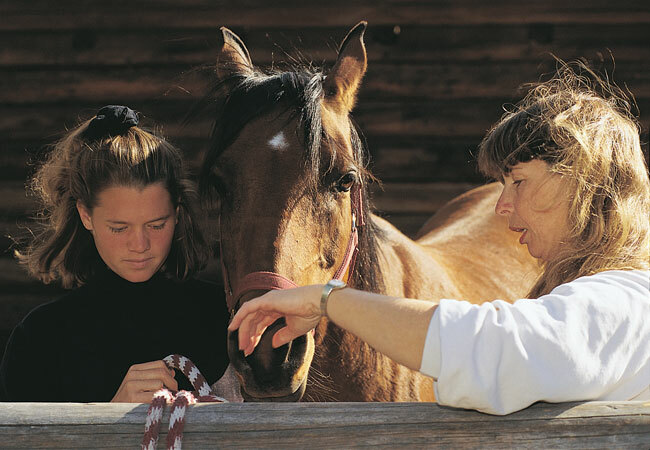 They gain these skills by being taught all aspects of horse care, horse anatomy, health, diseases, safety, ground handling skills, riding skills and general care and feeding. In the equestrian classes our students learn to nurture and care for horses, and this interaction helps them explore their own humanity. If a student has difficulty with intimate relationships, bonding with an animal can be an important step in learning how to have responsible, caring and clear interactions with another person. One way they develop intimacy is by learning to observe and identify how their patterns of behavior affect their relationship with animals, and then how to transfer that knowledge to other relationships. Horses can act as emotional analyzers. They respond to non-verbal cues and body language. If a person becomes frustrated or angry, the horse will respond to those emotions rather than any other direction given to them. Conversely, if a person is codependent or enabling, their body language will not convey conviction and the horse will not respond. If a person is afraid, the horse will react with fear. This is a critical tool in working with therapeutic issues. Our students learn that they cannot change people, places, things and situations, but can only change themselves. Learning about their physical being is an essential element for the development of their emotional, cognitive and spiritual well being. Working with the horses can give them important and immediate feedback about their emotional state and how their emotions are stored in their bodies.